Josh grew up in Evanston, Illinois and graduated from the University of Notre Dame in 2012 with a BBA in Accountancy. 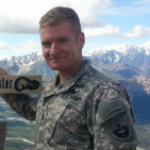 He then served for four years as an active duty infantry officer, mostly in Alaska. In the fall of 2016, Josh started law school back home at Northwestern. He has interned at the Gang Crimes Unit of the Cook County State&#039;s Attorney&#039;s Office and a District Court judge&#039;s chambers in the Northern District of Illinois. He will join Sidley Austin&#039;s Chicago summer associate class in 2018.